Did you know the moon has an atmosphere? I wouldn’t be surprised if you didn’t. Until just a few years ago nobody did. It’s not much. You can’t breathe it. We think it’s mostly dust. But we don’t know exactly what’s in it or how it works. How does an atmosphere operate when the days are 28 earth days long? That’s 14*24=336 hours of daylight followed by 336 hours of night time. How does an atmosphere work when the gravity is 1/6 that of Earth? How does an atmosphere work when it’s bombarded by the sun’s solar wind at a million miles an hour? How does an atmosphere work when the sunlit portion of the moon is +120 degrees C (hot enough to boil water) and the dark areas are -170 degrees C (cold enough to freeze air)? Those are the kinds of questions NASA is trying to answer with the LADEE satellite, the Lunar Atmosphere and Dust Environment Explorer. Technically the atmosphere on the moon is called a ‘surface boundary exosphere’. “Surface Boundary” means that it goes all the way down to the surface. But it’s a trillion times thinner than the air we breathe here on Earth. It’s so thin that the molecules in it basically never touch each other. It’s thinner than the ‘air’ at the height of the International Space Station’s orbit 250 miles up. The Earth’s magnetic field protects our atmosphere from the sun’s ‘solar wind’ – not wind like we normally think of it, but a plasma of charged particles, most of them single protons. A single proton is the nucleus of a hydrogen atom. When is doesn’t have any electrons with it we call that an ion and write it “H+”. And it turns out there are lots of oxygen atoms on the moon. When one of these H+ ions comes in contact with an oxygen atom, they form a pair written as OH and called a hydroxyl. Add a second hydrogen and you get H2O, better known as a water molecule. Is there water on the moon? Yes, there is! These OH and H2O molecules make up a part of the moon’s atmosphere. 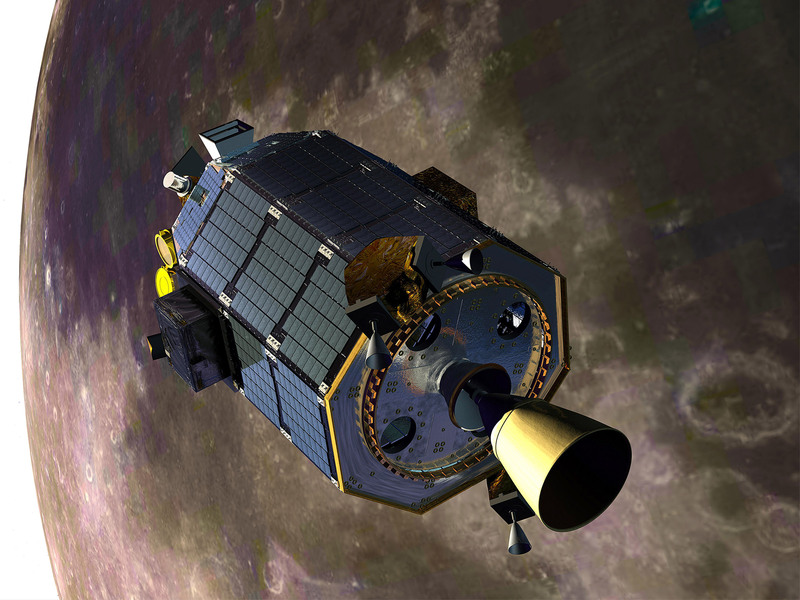 The other big part – we think – of the moon’s exosphere is dust. Ever see a shooting star at night? That’s a bit of rock from space burning up in the Earth’s thick atmosphere. If that bit of rock hit the moon, the exosphere there isn’t enough to slow it down much less burn it up, and it hits the moon at many thousands of miles per hour. When that happens a lot of dust gets kicked up, and how much depends on how big the rock is and how fast it’s going. But scientists don’t really know just how much dust or what it’s really made of – that’s the “Dust Environment” portion of LADEE’s name. LADEE launched from the eastern shore of Virginia on September 6, 2013 at 11:27 at night (Eastern Time). 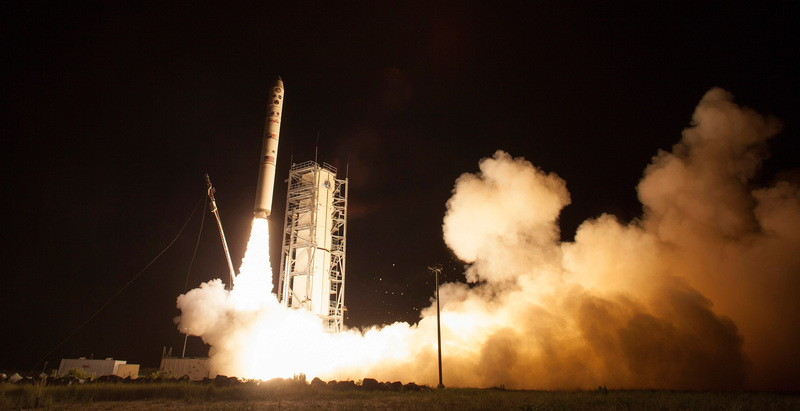 The countdown and launch went perfectly, and the Minotaur V rocket put LADEE into an almost perfect orbit. The launch was very bright and was seen by thousands of people from North Carolina to Maine. 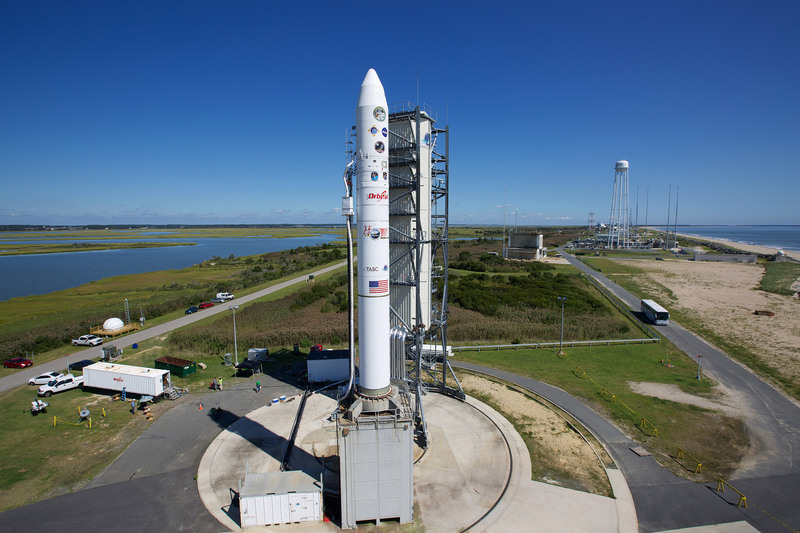 The launch took place at the NASA Wallops Flight Facility and the rocket was built and flown by a joint effort of the Air Force and the Orbital Sciences Corporation. The Minotaur V lifts off very quickly – rocket reached mach 1 in 20 seconds! The first stage burned out in 57 seconds and was travelling at mach 4. There are some great videos of the launch on YouTube. NASA invited television and newspaper reporters as you would expect, but there are 50 people for something called a “NASA Social” as well. They come from as far as Oregon, Oklahoma, and Texas! They come from all walks of life including teachers (one of whom is streaming live to his classroom!) welders, photographers, sales and marketing, and a tattoo artist. I was one of those invited. I post lots of stuff about space on Twitter and Facebook and I signed up when NASA announced the opportunity on Twitter (the twitter handle is @NASASocial). 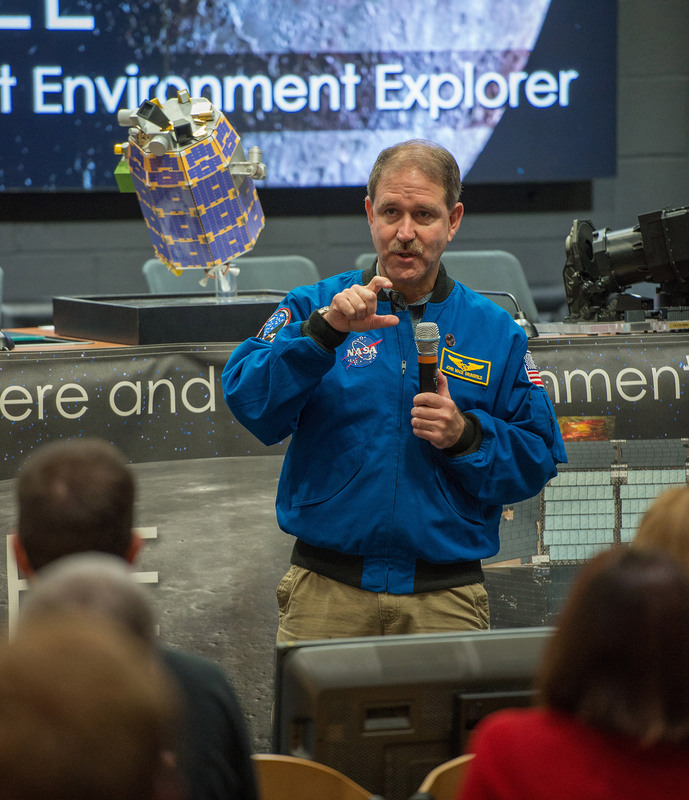 I highly recommend trying to go to one of these NASA Social events – I have been to a few and seen two rocket launches and met 6 astronauts. There was one other ‘uninvited’ guest at the launch. A frog was evidently in the water used to cool the area around the rocket launch pad and was ‘rocketed’ up into the sky when the Minotaur V lifted off. A picture of him was taken by an automated camera set up by NASA photographer Chris Perry. The frog is now tweeting about his experiences on twitter @RocketFrog1. Anyone can participate in the science of LADEE. The MeteorCounter app for smart phones allows for anyone to count the number of meteors entering Earth’s atmosphere. That’s an important number to know since the moon and Earth fly through the same area of space together. If you’re counting the number of meteors entering earth’s atmosphere, you’re basically also counting the number of meteors hitting the moon (remember the dust?). Since these meteors can be as small as a grain of sand, the impact on the moon won’t be visible from earth (it’s much too small), but they can make a bright streak in the Earth’s atmosphere. All you need to help out there is a smart phone and a blanket or lounge chair. Look up at night and count the meteors. A meteor impact on the moon can be visible on earth with a telescope as small as 8” in diameter for meteors as small as a walnut! So if you have a telescope or a smart phone, you can also participate in LADEE science! For more information on LADEE, visit NASA’s LADEE webpage at www.nasa.gov/ladee.